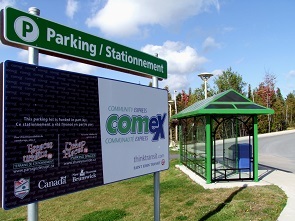 The COMEX Bus Service, operated by Saint John Transit, shuttles commuters to/from the Kennebecasis Valley to the City of Saint John on a daily basis, Monday to Friday. Since its inception in 2006, ridership has been growing steadily. In 2010, a new articulated bus was added to the fleet to accommodate increased demand. Passes can be purchased in Quispamsis at the Town Hall and Shoppers Drug Mart. A shuttle service is available for Kennebecasis Valley residents who are wheelchair bound wishing to travel within the Kennebecasis Valley and to Saint John. Users are encouraged to reserve a day in advance. Co-sponsored by the Towns of Quispamsis and Rothesay, and the KV Committee for Disabled Persons. To book a ride or confirm a price, contact A2B Transport at 631-0968 or Ecotrans at 638-9223. For information about the service, call the KV Committee for Disabled Persons at 847-5609.